This is an article written by our Fellow Likumbi Kapihya. Please read the full article on LinkedIn. 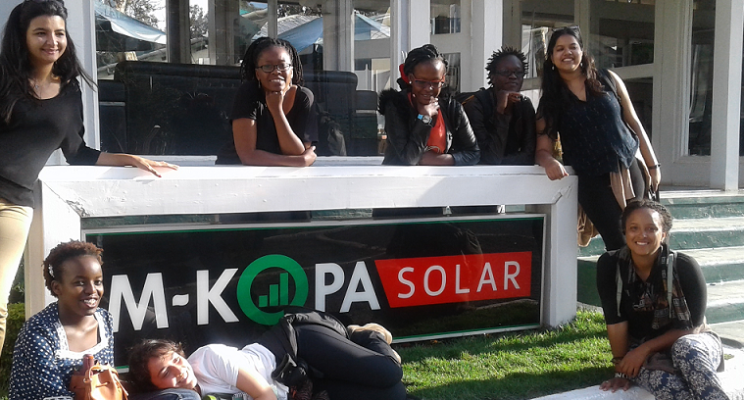 I had the privilege of visiting the biggest paygo solar provider in Africa, Mkopa, as part of the curriculum of the Social Innovation Management post-graduate programme at Amani Institute. The social enterprise has been in operation for the last five years and has sold over 600,000 units in East Africa. The Nairobi campus houses over 100* staff and is a well-oiled, data driven machine that tracks everything from how long customers stay on the phone when they call the customer center, to how much time they take between top-ups and how they use their units. Daily sales can easily top 3 million KES which is just over USD 29,000. M-kopa is a business with a capital ‘B’. This data-driven, money-making focus was questioned by some of my colleagues. Was M-kopa simply lining its pockets or was it really giving back to the community? While the provision of affordable, clean energy was all well and good, what about those who could not even pay the minimum $35** commitment fee? Furthermore, was their relationship with the customer purely transactional – did they really support communities in need? The questions revealed a tension that is not so far from the surface in this relatively new era of social enterprises which use business metrics to create social impact. The field is so new that you can find a variety of definitions for social enterprise –from triple bottom lines to benefits that accrue to society. The simple answer to my colleagues is that M-kopa does in fact ‘give back to the community’ as a social enterprise and it offers a new approach to tackling the challenges experienced by some marginalized communities. I have just to points to add when tackling the issue of giving back. First, we must define what it means to give back to the community. Invariably, when pressed for a definition I found that this idea of giving back to the community requires providing something without an expectation of something in return – quite simply, providing something for nothing. This is premised on the idea that these most vulnerable in society could not possibly pay for services or goods and charging them is akin to exploitation. I do not disagree that there are those who could not possibly afford the lower priced goods and services social enterprises like M-kopa, Livelihoods or Living Goods. These segments of our society need charity in its truest form. However, we should be careful not to judge a social enterprise by metrics used for charities. Quick correction: we employ 650+ staff in Nairobi (and 1,000 globally), not counting the 1,000 sales team who get their livelihoods through M-KOPA. And our normal deposit is $30, not $35, but we do have a cheaper deposit available (~$15-20). Read the full original article on LinkedIn!